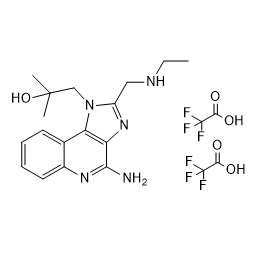 Gardiquimod trifluoroacetate is a specific TLR7 agonist which can also inhibit HIV-1 reverse transcriptase. Gardiquimod is a chemical compound which acts selectively at both mouse and human forms of toll-like receptor 7 (TLR7). It functions as an immune response modifier. Alpha-Lipoic Acid is an antioxidant, which is an essential cofactor of mitochondrial enzyme complexes. α-Lipoic Acid inhibits NF-κB-dependent HIV-1 LTR activation. Nevirapine is a non-nucleoside inhibitor of HIV-1 reverse transcriptase used to treat and prevent HIV/AIDS; with a Ki of 270 μM. KP-1461 is a deoxycytidine analogue that is randomly inserted into HIV DNA by reverse transcriptase where it can cause base mispairing and introduce mutations that decrease viral fitness. TAK-779 is a highly potent and selective nonpeptide CCR5 antagonist with a IC50 value of 1.4 nM in the binding assay, TAK-779 also inhibited the replication of macrophage (M)-tropic HIV-1 (Ba-L strain) in both MAGI-CCR5 cells and PBMCs with EC50 values of 1.2 and 3.7 nM, respectively. Lavendustin B is a Tyrosine Kinase Inhibitor amd an inhibitor of HIV-1 integrase (IN) interaction with its cognate cellular cofactor, lens epithelium-derived growth factor (LEDGF/p75). 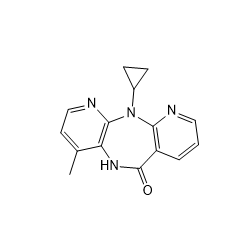 Apricitabine, also known as (-)-BCH-10652; (-)-dOTC; AVX-754; BCH-10618; SPD-754, is an experimental nucleoside reverse transcriptase inhibitor (NRTI) against HIV. MK-2048 is a potent inhibitor of integrase (IN) and INR263K with IC50 of 2.6 nM and 1.5 nM, respectively. 3-Deazaadenosine is an inhibitor of S-adenosylhomocysteine hydrolase, with a Ki of 3.9 µM; has anti-inflammatory, anti-proliferative and anti-HIV activity.